Tonight (Tuesday, June 15th), from 7pm to 9pm, I’m leading a Running Effective Meetings Workshop at the LA Eco-Village, and I invite you to attend. To rsvp, contact crsp@igc.org or 213/738-1254. $35 sliding scale. 1. Designate a Facilitator: Whether it’s a member of the group such or your group decide to bring in an outside facilitator, the facilitator’s role is to help keep the group focused and moving forward. 2. Develop an agenda before the meeting: At the core of a good agenda are items that require the group to make decisions. Project how much time each item will take and assign the outcome you hope to accomplish. 3. Stick to the agenda during the meeting: Many temptations exist to stray off topic. Stay focused to get the work done you need to get done and record other ideas brought up at the meeting for future meetings. 4. Record decisions made: Have a notetaker at every meeting to take minutes and have them record each decision, who is responsible for implementing it and if any future actions need to happen. 5. Start and end on time: When groups slide from starting and ending on time, people loose motivation for attending meeting. 6. Set groundrules: Groundrules help ensure civility between members. Some examples: test assumptions, share all relevant information and focus on interests, not positions. 7. Address conflict when it comes up: Dealing with conflict can be challenging but not dealing with it and letting it fester can potentially be worse. 8. Use graphics: Have someone scribe notes on a dry-erase board or poster paper to visually record people’s thoughts. 9. Evaluate: Occasionally ask what about the meetings work well and what could be improved…experiment with ways to improve meetings. 10. Thank people for attending: If folks feel appreciated and valued, they are more likely to show up at future meetings, especially if they are a volunteer. If you’re group needs an outside facilitator to make your meetings more effective, please contact me. 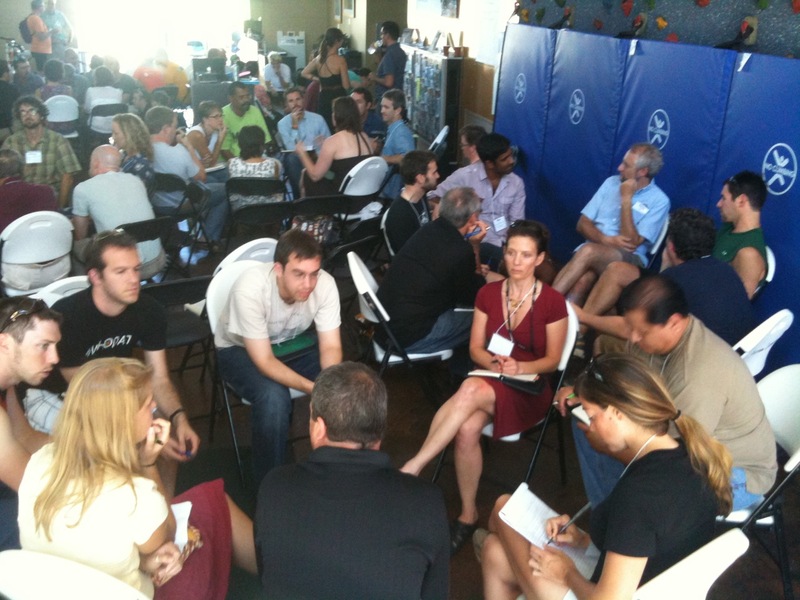 Tomorrow night (June 9th), Ron Milam will lead an Advanced Facilitation training at the LA Eco-Village. The following week on June 15th, he’ll lead a Running Effective Meetings training. You are welcome to attend one or both of these trainings. This workshop explores more sophisticated tools and strategies that facilitators use to ensure groups effectively reach decisions. Participants will have the opportunity to practice facilitating challenging situations and receive feedback from the instructor and training participants. Recommended pre-requisite: Intro to Facilitation or some facilitation experience. This workshop explores the key components necessary to ensure meetings are effective and result in decisions that help an organization move forward. These components include: developing an agenda, knowing people’s roles and responsibilities, having a decision making process, facilitation and good listening skills. For more information Ron Milam’s work as a facilitator, click here. 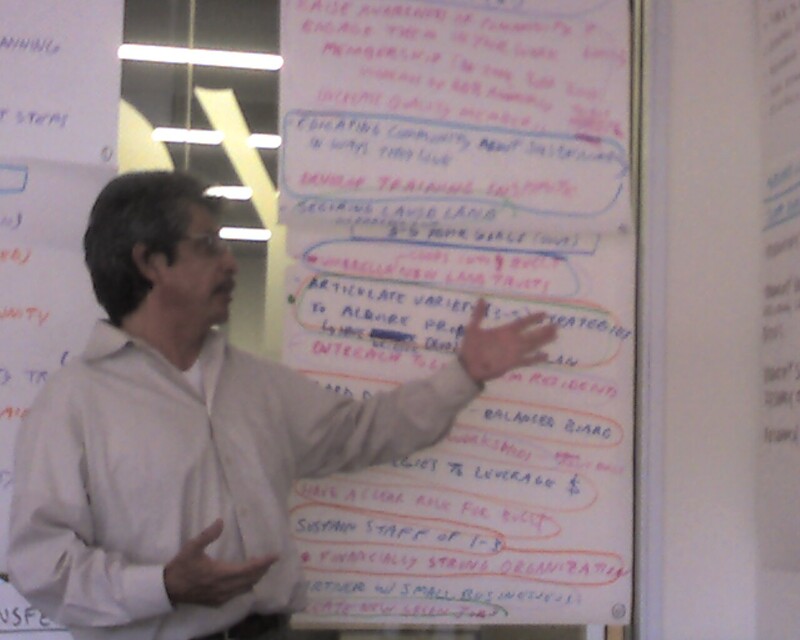 Ron will also lead another Introduction to Facilitation training on July 28th from 7pm to 9pm at the LA Eco-Village. A good facilitator brings some important materials to a meeting including an easel, markers, a small clock and most challenging of all to carry on a bicycle, a full sized posterboard to scribe notes to capture everyone’s good thoughts. Up until now, I have always asked clients to bring the posterboard because it was too challenging to secure on my small bike rack. For a recent peer learning session I led for the Liberty Hill Foundation, one of the leading funders of social change movements in Los Angeles, I decided I would incorporate a little social change in my own lifestyle and bring everything to the training by bicycle. 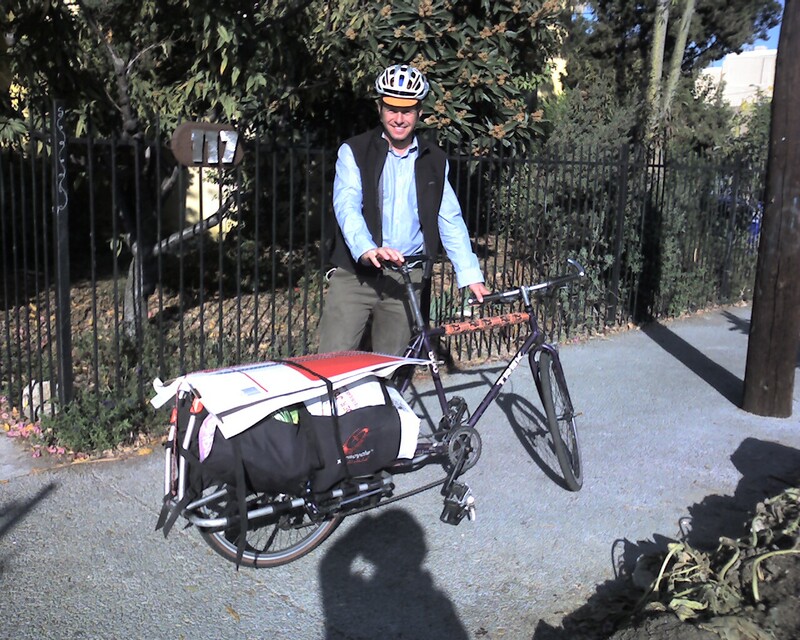 Knowing I couldn’t fit everyone on my existing bike, I remembered one of my neighbors here at the LA Eco-Village has an XtraCycle I could borrow, which is a bicycle trailer device designed to carry heavy loads. 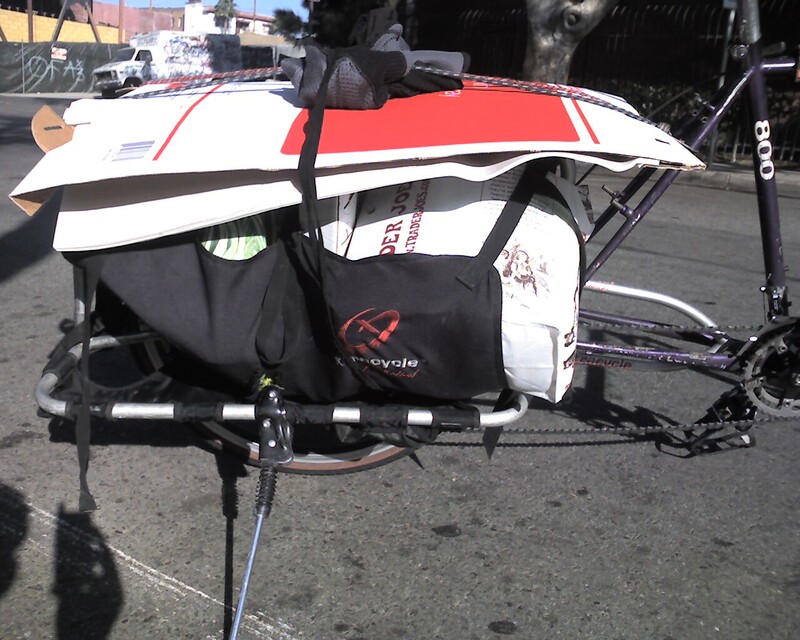 I’m excited to report that I successfully carried the following items on one bicycle: that big posterboard, an easel, markers, handouts, my laptop computer and three bags of groceries that fed an impressive group of 15 leaders working on social change here in Los Angeles. I really enjoyed the ride and the discussion that followed it. Now that I know it can easily be done, I look forward to hauling all of my facilitation tools on bike to future trainings, retreats and meetings. While I can’t confirm it, I just might be able to say I’m the only bicycling facilitator in Los Angeles! If you need a facilitator or want to know more about what a facilitator does, check out my website. See you on the streets of Los Angeles and remember that you can always carry more stuff on a bicycle than you think you can. I’m pleased to base my consulting business out of the Los Angeles Eco-Village. Since I work primarily with urban sustainability oriented nonprofit organizations in Los Angeles, living and working at the Los Angeles Eco-Village definitely inspires me and has taught me a lot about sustainability. 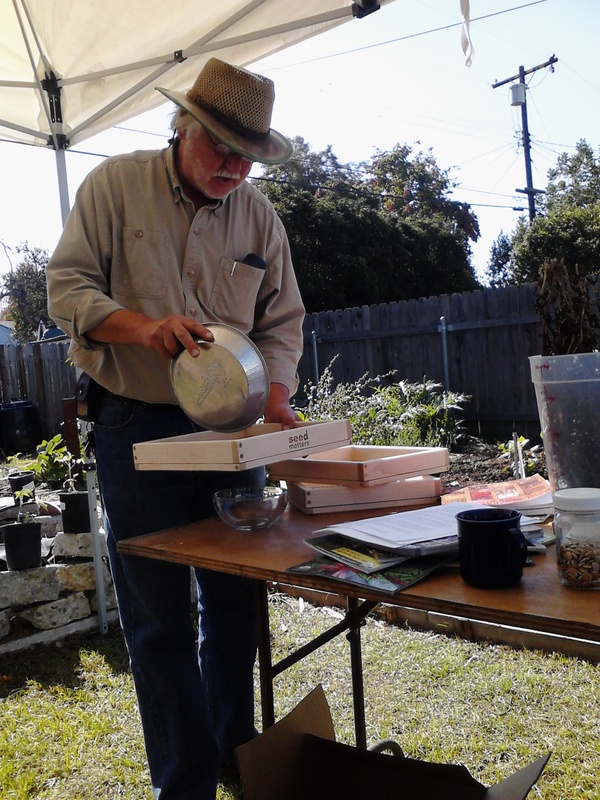 Living at the Los Angeles Eco-Village has played a key role in teaching me how to become a good facilitator. I remember going to retreats that the Eco-Village had several years back led by experienced facilitators and taking detailed notes on how they helped guide us towards making important decisions. I then had the opportunity to practice these skills facilitating one of our many weekly meetings where we make decisions by consensus. I now professionally facilitate for local nonprofit organizations, with the most recent retreat being for the Los Angeles Audubon Society (see my recent blog post on Facilitation and Flying for more details). I’m pleased to offer an upcoming Introduction to Facilitation workshop at the Eco-Village on September 29th, from 6:30pm to 8:30pm and welcome you to attend. More information about this workshop can be found at laecovillage.org. I also lead a wide variety of trainings to build the capacity of nonprofit organizations and welcome you to attend any of those as well – for information see the calendar page at my website.